Lady Sabre & The Pirates of the Ineffable Aether - Gobble gobble! As the picture says, happy Thanksgiving! We’ll be taking the next week off to regroup a bit, visit our families, and eat. American readers: Safe travels throughout the next week, and enjoy your turkey, or perhaps tofu- or seitan-based alternative. Canadian readers: Sorry this is a month late! International readers: Thank you for your patience this week! We’re most thankful this year for all of you, and your ongoing interest in the adventures of our air pirate crew. If you haven’t already, let us know who you are! I love the picture. Have a safe and happy Thanksgiving, guys! Wait….I know that guy!! Wasn’t that one of the gunmen on the docks in a previous chapter? 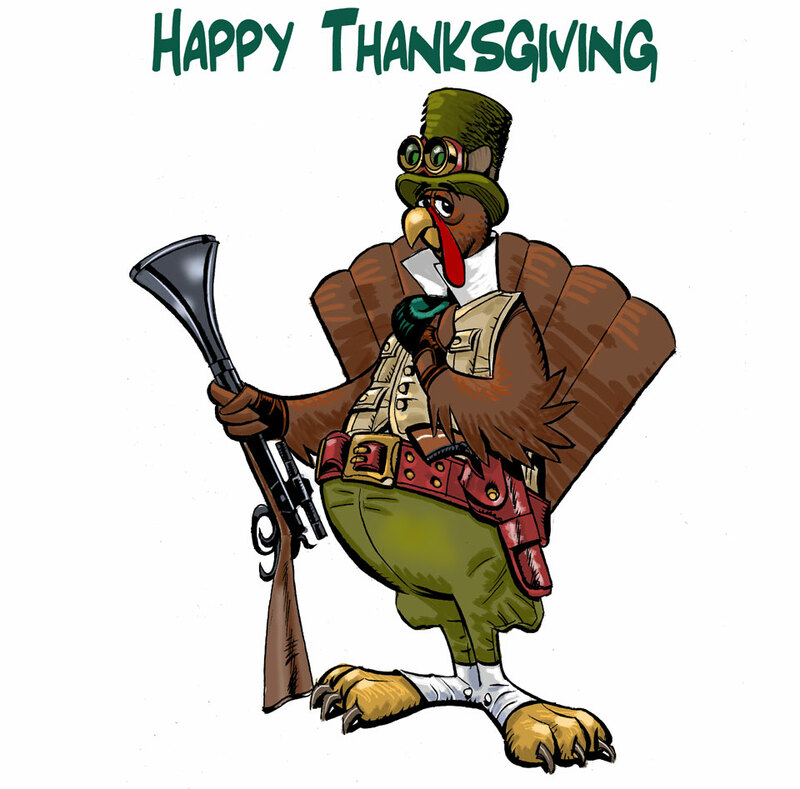 Happy Thanksgiving to the crew and everyone else aswell. You’ve earned some rest, can’t wait for the comic to continue. Superb! Caught up all eight chapters in one sitting. Haven’t done that for a while! Love the comic. Wonderful storytelling, gorgeous art, fascinating world, terrific characters! Can’t wait to see more. Much thanks!